2016 is the 10th anniversary of affordable housing bonds! The City of Austin is the first – and only – Texas municipality to use general obligation bonds for affordable housing. It all started in 2006 when voters overwhelming approved $55 million in housing bonds. Fast forward to 2013 when two-thirds of voters approved an additional $65 million in housing bonds. The 2006 bonds were invested in multifamily housing development, including permanent supportive housing for single adults, single-family housing development and home repair – resulting in more than 3,400 affordable units. 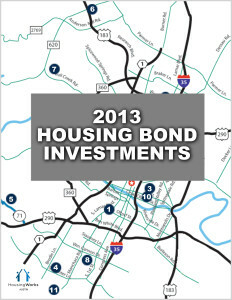 To date, the city has committed $26.4 million (approximately 40%) of the 2013 housing bonds. These funds are being invested in 12 multifamily developments (11 new construction project and 1 substantial rehabilitation) throughout the city, which will provide more than 1,400 units of affordable housing. Click the image to the right to find a detailed list and map of those properties. One of those projects is Foundation Communities’ newest rental community, Homestead Oaks. With $1 million in housing bonds – coupled with additional local dollars – Homestead Oaks will be home to 140 families in a beautiful, 29-acre setting on Slaughter Lane in southwest Austin. From developing green, sustainable and affordable housing to providing after school programs in the state-of-the-art onsite learning center, Foundation Communities is creating housing where families succeed. Through our Keep Austin Affordable Initiative, we have put together a video tour of that beautiful and trailblazing property. Click on the image below to watch it. In honor of the 10th anniversary of the housing bonds, HousingWorks is undertaking a detailed Return on Investment Analysis. In 2012, HousingWorks commissioned Civic Economics to complete an economic analysis of the 2006 bonds. The study showed that the initial $55 million investment had an estimated economic impact over 10 years of $865 million. We are eager to learn about the potential impact – jobs created, funding leveraged, local multiplier effect, etc. – of the 2013 bonds. HousingWorks is starting to compile the 2013 bond data. Look for the final report in early summer 2016!